Learn the latest hip-hop dance styles with professional choreographer to the music business, Rhapsody. Her dance moves are sweeping the nation, and her signature style of Street Jazz fusing hip-hop and jazz will blow you away! 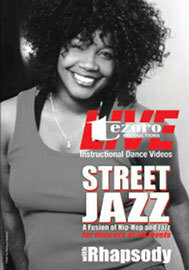 In this DVD you will learn three hot routines for the beginner, intermediate and advanced dancer. Rhapsody incorporates the use of body mechanics, musicality and distinctive performance techniques to help you become a better hip-hop dancer. If you want to take your hip-hop to the next level, then this video is for you! Rhapsody's professional credits include choreography for Beyonce, The Jonas Brothers, Pussycat Dolls, Spice Girls, Cassie, Jay Sean, "Step Up 2: The Streets" Movie, and much more.